Hi! I feel like every time I write a new post, I talk about how long it’s been since my last one. Yeah. Well. I’m trying! I always have a bunch of things to blog about and no time to actually sit down and do it. But here I am at a slow day at work, with plenty of time to devote to my Thanksgiving posts. For Thanksgiving I traveled (by way of a 7 hour long bus ride from hell…but that’s a different story) to Boston to visit a friend for an extremely low-key, two-person Thanksgiving. Now to be quite honest, Thanksgiving for 2 people is hard! I know how to make this kind of food in vast quantities, but for just me and one other person it’s kind of an odd situation. I wanted turkey, but how are two people supposed to eat an entire turkey by themselves…? Unfortunately, I didn’t get my turkey. But I did make a fabulous roast chicken, twice-baked sweet potatoes, and Armen made his contribution of carmelized onions (thanks, Armen). I made a slightly adapted version of these bars as our Thanksgiving dessert. I cannot explain how badly I wanted pie, but Armen is picky/rude and vetoed both pumpkin and apple pie. I don’t want to talk about it. I was devastated. Also limited resources meant we had no pie pan, etc. etc. 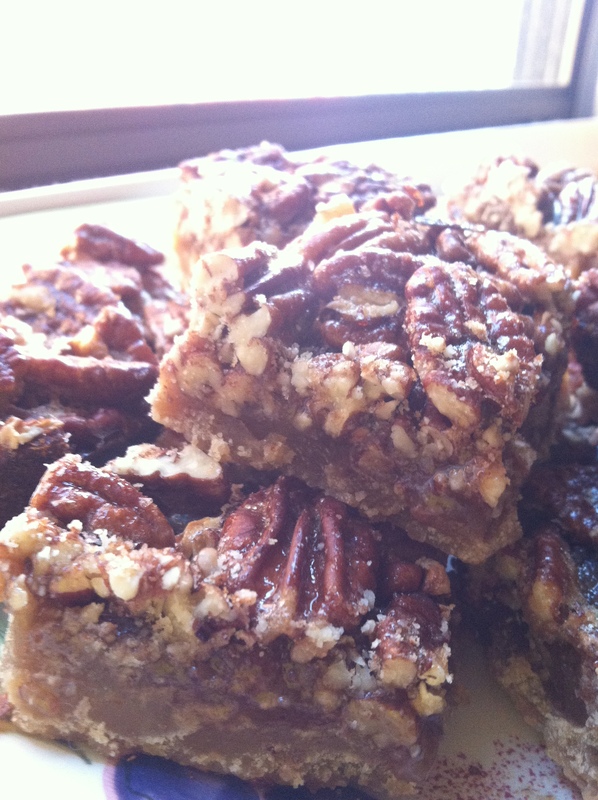 So we compromised and settled on pecan pie bars. Okay, to be fair, these were awesome. I really, truly enjoyed every bite of every one of these bars I ate (I ate at least…6 or 7? Oops) and would definitely make them again. I still resent them the teensiest, tiniest bit, but that’s just because I wanted a fall fruit pie so badly. In reality, these were really great. Make ’em. Preheat the oven to 375. Cream the sugar and butter together until combined, then beat in the flour until the mixture becomes crumbly but sticks together when pressed. Press this with your hands into the bottom of an 8×8″ pan and bake for 10-15 minutes until the crust looks dry and a little bit puffy. While your crust is baking, whisk together the egg, honey, more brown sugar, maple syrup and vanilla. 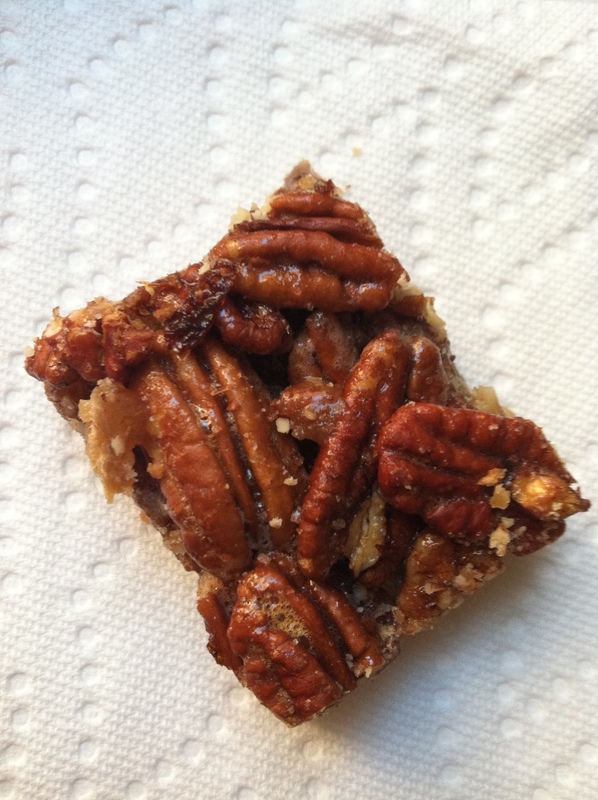 Once combined, stir in the pecans until coated and pour into the crust once it’s out of the oven. Rearrange the pecans a little if needed and stick it back in the oven for about 15 minutes, or until the filling is almost completely set. Remove from the oven and sprinkle with salt. Let them cool in the fridge (preferably overnight) before serving. I know, OVERNIGHT? The horror. Your kitchen/entire apartment will smell so delicious after baking these, but you must resist the urge to eat them fresh out of the oven! They won’t hold together and you’ll be eating a weird, soupy mess. Although I considered trying a warm one, I used my will power and managed to wait. I was so proud of myself. I tried these in a variety of ways (all in the name of blogging, of course……): once heated in the microwave topped with vanilla ice cream, a bunch of times just plain cold out of the fridge, and twice cold with vanilla ice cream on top. My personal favorite was definitely cold, paired with ice cream. No comparison. The ice cream makes the already cold bars even chewier, and the vanilla adds an amazing contrast to the maple-y, nutty goodness. You have to do a little bit of aggressive crushing with your spoon in order to get proper bites, but it’s worth the extra effort. The two servings of these bars I ate like this were consecutive; I simply could not stop at just one. Make these for some holiday gathering or something! Or to bring to work! Or to share with friends! Or to keep all to yourself! Just make these. They’re festive and great. 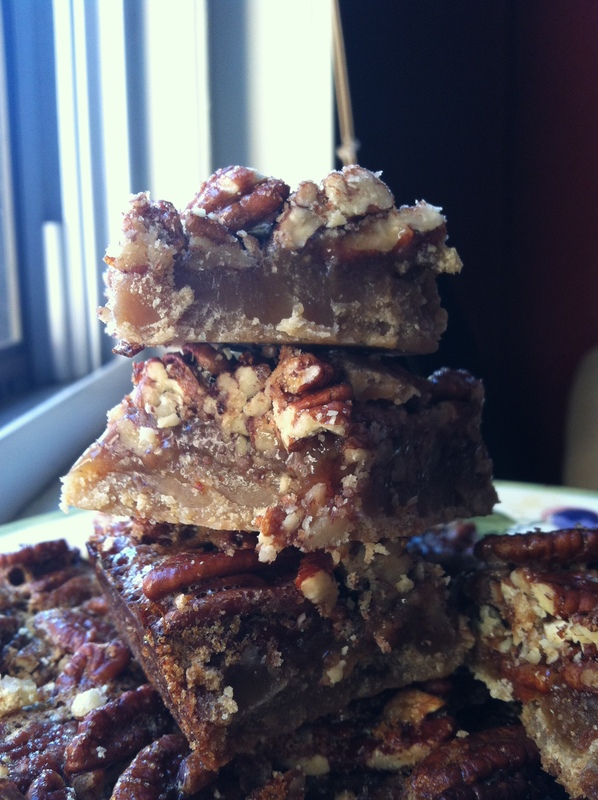 Categories: Dessert | Tags: dessert, pecan, pecan pie bars, thanksgiving | Permalink.